I love the porter style, and this recipe is one my most requested among those who help me consume my brews. After moving, and coming to realize my supply of porter was nearly gone, I decided to re-brew this recipe. Of course, planning to brew a recipe doesn’t always mean you get to brew that recipe. I’ve been pushing to use up ingredients I have on-hand, and as a result I had to make a few adjustments to the grain bill. Mostly little stuff, hopefully not too noticeable. A friend helped me brew this batch, and it’s always nice to have someone to talk to while you’re brewing. The process can drag a bit through the mash. Once I’m done with the mash, I usually get pretty busy with cleaning & santizing, monitoring hop additions, getting the wort chiller ready. 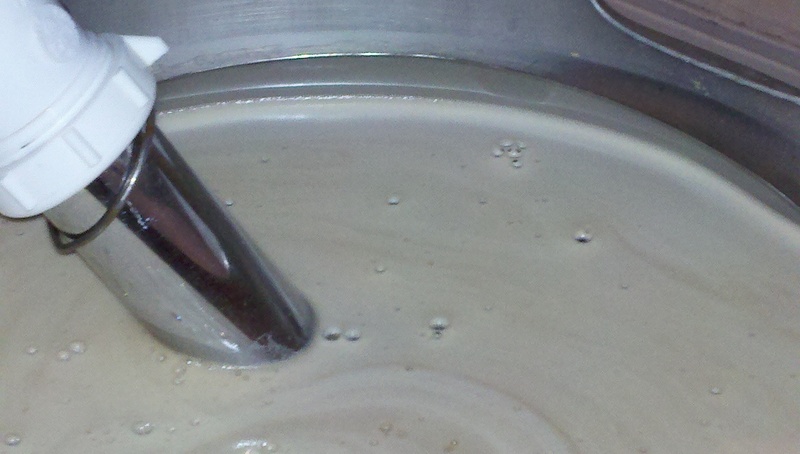 Yeast got pitched, beer got fermented cool but it kicked up super active in less than 24 hours. The Fermometer stuck to the side of my fermenter rose from 59 degrees F to 63 degrees F during active fermentation. Unfortunately, I forgot to take an original gravity reading. Based on the previous batch, which had a final gravity of 1.008, I think this will be close to the original version. What’s the first recipe you developed that you were excited to re-brew? Pingback: Back to Back Brew Days - Super Brewers!